Bestselling author M. Isabel Valdés believes wholeheartedly in the power of In-Culture© and Share-of-Heart marketing. Hispanic Customers for Life: A Fresh Look at Acculturation shows how the U.S. Hispanic market is shifting from a majority of customers who are unacculturated to a majority who are born in the United States, and are melding the two cultures together in ways that make them an unprecedented marketing challenge. The Hispanic market is experiencing its most important socio-demographic and cultural shift since its emergence as a powerful and distinct U.S. market segment. 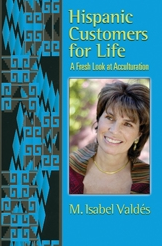 Hispanic Customers for Life: A Fresh Look at Acculturation explores the present “Hispanic generational crossover,” providing insights, data and tools to manage the generational and acculturation differences among U.S. Hispanics, immigrants and their U.S. born offspring. The growing relevance of “emotional marketing” to build HeartShares, the “how to’s” and new the gold standard are described and illustrated with business case studies. An additional value of the book is a comprehensive list of Hispanic-related websites, including marketing and advertising companies, trade organizations, non-profits, media, and researchers.